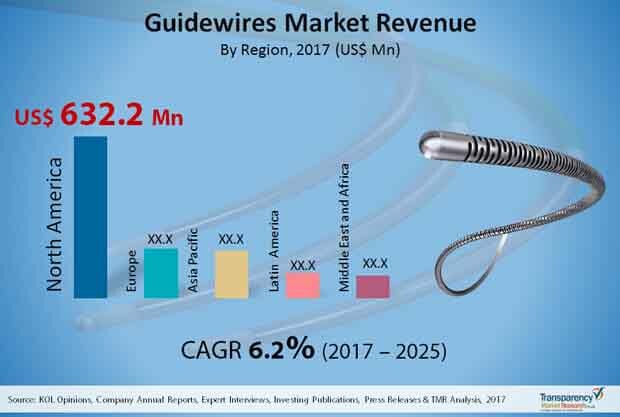 The global guidewires market is prognosticated to grow significantly within the span of forecast period from 2017 to 2025. The leading organizations are focusing on the research and development activities in order to launch some really innovative ad efficient products in the market. This is a key strategy among the players which helps in the growth of revenues and sales of the companies. Owing to this, there has been a notable rise in investments as well. Terumo Medical Corporation, Abbott, Integer Holdings Corporation, B. Braun Melsungen AG, ASAHI INTECC CO., LTD., Olympus Corporation, Medtronic, Cardinal Health, Inc., Stryker, CONMED Corporation, Merit Medical Systems, Inc., Cook, and Boston Scientific Corporation are some of the key players leading the global guidewires market. Besides, some of the other well-known names in the market are EPflex Feinwerktechnik GmbH, Entellus Medical, Inc., and SP Medical A/S. According to a recent report by Transparency Market Research (TMR), the global guidewires market is anticipated to register a steady CAGR of 6.2% within the forecast period from 2017 and 2025. In 2016, the market was valued around worth of US$1.6 bn. This valued is expected to reac around worth US$2.7 bn by the end of 2025. Based on product, the coronary guidewires segment held the maximum share in the entire market due to noteworthy rise in the cases of cardiovascular illnesses all over the world. Geographically, at present, North America region accounts for major share in the market. This can be credited to the rise in lifestyle-related ailments, growing popularity of sophisticated guidewires, increase in adoption of minimally invasive surgical processes, and presence of several major players in the region. Some of the key factors propelling the growth rates of the global guidewires market are rapid increase in the adoption of minimally invasive processes, for the treatment of various ailments, such as prostatic stenting, angiography, transurethral needle ablation, transurethral electroporation of the prostate, and transurethral microwave. Moreover, rise in per capita expenses in healthcare sector is another contributing factor in market growth. Currently, the end-use segment of hospitals is fueling the highest demand in the global guidewires market due to increased preference by the patients for minimally invasive interventional procedures. Besides, clinics is another segment which is supporting the substantial demand in the market, coupled with rise in number of ambulatory surgical centers. However, on the other hand, high cost of guidewires because of so much of time spent in their research and development activities is a factor that is likely to hamper the market growth in coming years. Moreover, since these wires are non-reusable in nature, which makes them a non-preferred choice among the customers. Rapid increase in the adoption of minimally invasive processes, for the treatment of various ailments supports market growth. The end-use segment of hospitals is fueling the highest demand in the global guidewires market due to increased preference by the patients for minimally invasive interventional procedures.